The FILE of LIFE program helps members of the Police and Fire Department provide services at times when you or a family member may not be able to communicate effectively due to medical reasons or personal injury. 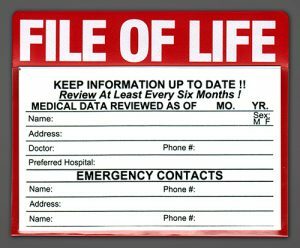 Residents with any medical problems, seniors, and other interested citizens are provided a FREE FILE of LIFE packet. The packet consists of a door decal, a File of Life Information Card, and a magnetized vinyl cardholder for placement on your refrigerator door. The door decal alerts first responders when they arrive that they can easily find your FILE of LIFE in plain view on the front of your refrigerator. The information card includes: medication taken, allergies, medical conditions, blood type, recent surgery, and emergency contact information. This card is then inserted inside the vinyl cardholder and placed on the refrigerator door. Everyone who has a medical condition should complete a FILE of LIFE. 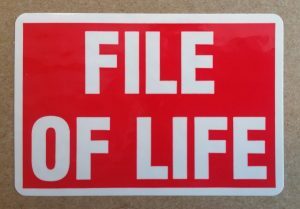 Obtain your FILE of LIFE today!